NewerTech announced its 2TB Guardian MAXimus mini quad interface portable RAID solution for Macs and PCs. Newer Technology, Inc. (NewerTech®) http://www.newertech.com, a leading developer of Macintosh®, PC, iPod®, iPhone®, and iPad™ performance upgrades and accessories, announced today that it has added a new model - featuring dual 2.5" 1.0TB SATA drives for up to 2.0TB of storage - to its bus powered (no AC adapter needed) ultra portable Guardian MAXimus® mini storage solution line. The new $299.99 MSRP model provides 1.0TB hardware RAID-1 redundancy for a MAXProtect “mirrored” copy of data or a 2.0TB RAID-0 mode for MAXPerform speed and a “Quad Interface” of FireWire 800/400, USB 2.0, & eSATA connections to offer Mac and PC users Plug and Play data transfer speeds up to 300MB/s. The NewerTech Guardian MAXimus mini, a Visionary Product Awards finalist at CES in the Storage Visions 2011 Awards Program, is available immediately in seven hard drive based models with up to 2.0TB of capacity and three Solid State Drive (SSD) models with up to 960GB of storage capacity starting at $179.99 MSRP from NewerTech’s exclusive distributor, Other World Computing (OWC®), as well as through the retail channel. 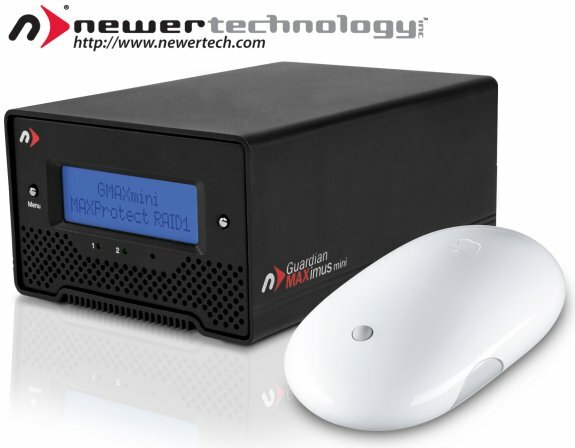 For more information on this new storage solution, as well as reseller inquiries, visit: http://www.newertech.com/products/gmaxmini.php. For more information on NewerTech’s complete line of accessories and upgrades for Macs, PCs, and iDevices, visit: http://www.newertech.com/products. Guardian MAXimus mini comes factory set as a RAID-1 Plug And Play “live activity” data redundant/backup solution ideal for “in the field” storage and protection of financial records, medical files, business projects, wedding photography sessions, nearly any critical data capture scenario that consumer and professional users simply cannot risk losing. Always guarding against data loss and costly system downtime, the Guardian MAXimus mini MAXProtect mode writes the same information in real-time to two separate 2.5" SATA drives, each offering up to 1.0TB of storage capacity, for a “mirrored” copy. The Guardian MAXimus mini’s bus powered, fanless, and exceptionally compact design makes it ultra portable for ‘mobile office’ needs. Weighing in at less than 1/4th the weight and size of similar 3.5" based desktop RAID solutions, it provides maximum data protection with minimal bulk and use of space on a desktop or when carried in a gear bag. With a “Quad Interface” of two FireWire 800, one FireWire 400, one USB 2.0, and one eSATA ports and all connecting cables included, Guardian MAXimus mini doesn’t require any complicated set-up and is ready for Plug and Play use with legacy Macs, the latest Mac models, as well as PCs. It provides data transfer speeds up to 300MB/s and can be moved between different systems utilizing its supported interfaces with complete interoperability for maximum data backup performance and flexibility. Includes $100 retail value utility software bundle consisting of ProSoft Engineering® Data Backup 3, NovaStor NovaBACKUP®, Intech® SpeedTools Utilities™, and Carbon Copy Cloner.